3/4 cup flour 1 tsp baking powder 1/4 tsp salt 1 tsp canola or olive oil 1/3 cup milk In a bowl, mix dry ingredients; stir in olive oil and milk. Stir just long enough to make dough. 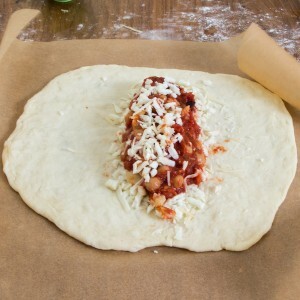 Bring the dough together with your fingers, gradually adding enough water, as before, to make a wet dough. Shape the dough into plum-sized balls. Shape the dough into plum-sized balls. Cut the dough into 12 evenly-sized pieces and gently form them into little balls. Be careful not to overwork the dough or you will end up with tough scones. Pop them on top of your cooked stew, ensuring there's enough liquid (see notes). Press the dumplings down a little so they are half submerged in the stew.